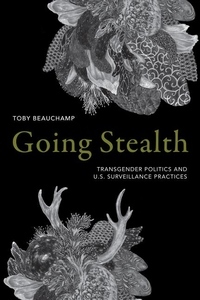 In Going Stealth Toby Beauchamp demonstrates how the enforcement of gender conformity is linked to state surveillance practices that identify threats based on racial, gender, national, and ableist categories of difference. Positioning surveillance as central to our understanding of transgender politics, Beauchamp examines a range of issues, from bathroom bills and TSA screening practices to Chelsea Manning's trial, to show how security practices extend into the everyday aspects of our gendered lives. He brings the fields of disability, science and technology, and surveillance studies into conversation with transgender studies to show how the scrutinizing of gender nonconformity is motivated less by explicit transgender identities than by the perceived threat that gender nonconformity poses to the U.S. racial and security state. Beauchamp uses instances of gender surveillance to demonstrate how disciplinary power attempts to produce conformist citizens and regulate difference through discourses of security. At the same time, he contends that greater visibility and recognition for gender nonconformity, while sometimes beneficial, might actually enable the surveillance state to more effectively track, measure, and control trans bodies and identities.